Minister for Finance Paschal Donohoe has announced measures for a new sugar tax in his Budget speech. 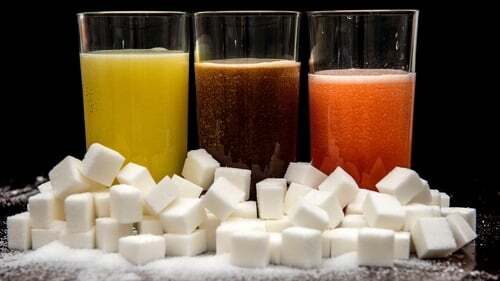 Tax of 30 cent per litre on drinks with over eight grams of sugar per 100 millilitres will be introduced, along with a reduced rate of 20 cent per litre on drinks with between five and eight grams of sugar per 100 millilitres. Mr Donohoe said these rates of tax are consistent with the rates being introduced in the UK in April next year and "our sugar tax will commence at the same time subject to State Aid approval". The Irish Heart Foundation said the introduction of a sugar tax was "a landmark day in the fight against obesity". Head of Advocacy Chris Macey said: "The introduction of a sugar sweetened drinks levy is probably the single most important action Government can take to tackle Ireland's obesity crisis." However, soft drinks manufacturer Britvic Ireland said it is "disappointed that the soft drinks sector has been arbitrarily singled out". It said: "Nearly 75% of Britvic Ireland products are already low or no sugar, and not subject to the tax, a journey that began in earnest long before talk of a sugar tax." The Minister for Health has said the estimated annual revenue to be raised from the sugar tax was €40m. Simon Harris said: "We've already seen companies begin to reformulate their products as a way of avoiding the tax, and that has been the norm across all European countries. "We have made it clear that we will not introduce this in this jurisdiction until it is introduced in Northern Ireland and the UK. I understand that the UK is likely to introduce this in April. "If they do we will proceed then, so it is about €40m as of now in a full year, obviously there won't be a full year benefit in 2018." Michael Healy-Rae of the Rural Independent Group has expressed his opposition in the Dáil to the introduction of a sugar tax. The Kerry TD described it as another unwanted burden of taxation on families. He also said he did not think it would make a difference. Minister Donohoe also announced an increase in the VAT rate on sunbed services from the reduced rate of 13.5% to the standard rate of 23%. He said: "This is in recognition of the clear evidence of a link between sunbeds and skin cancer, the most common form of cancer in Ireland." The Irish Cancer Society welcomed the move, saying it hoped it would lead to fewer young people using sunbeds. "Recent research commissioned by the society showed 150,000 people in Ireland used a sunbed in the last year," said Donal Buggy, the society's Head of Services and Advocacy. "The modest price increase from the VAT rise will hopefully disincentive sunbed use, particularly among young people, who are at greater risk from the harms of sunbeds. "In the long term, we would like to see an exploration of a complete, or partial ban on sunbeds, as part of the development of the Skin Cancer Prevention Plan by the Department of Health." The excise duty on a pack of 20 cigarettes will go up by 50 cents, with a pro-rata increase on other tobacco products. It will bring the price of the most popular brands of cigarettes to around €12. Ash Ireland welcomed the announcement, saying price was widely recognised as the most important way of encouraging smokers to quit. However, some campaigners described the increase as "unfair" and "irresponsible". "Ireland is already the most expensive place in Europe to buy tobacco," said John Mallon, spokesman for the smokers' group Forest Ireland. "Raising the price of cigarettes for the sixth consecutive budget is unfair because it disproportionately hurts those on lower incomes. "Evidence shows that a hike in taxes fuels illicit trade. It's no secret that Ireland has a serious problem with black market tobacco. Increasing the tax on tobacco is irresponsible because it will only make the situation worse. "Paschal Donohoe talks of building a fairer Ireland. Raising tax on tobacco does nothing to achieve that aim. It robs law-abiding consumers of their hard-earned cash and enriches criminal gangs." Meanwhile, there was no increase to the cost of diesel or in the excise duty on alcohol, the latter of which was welcomed by the Vintners' Federation of Ireland. Its Chief Executive Padraig Cribben said: "This Budget can be viewed from the licensed trade as being a neutral Budget and we welcome the maintenance of the 9% VAT rate which is so important to many members throughout the country." "We would like to have seen either a reduction in the very onerous excise levels on alcohol in Ireland or an indication that same would happen in the medium term with a view to bringing those levels back towards the European average."